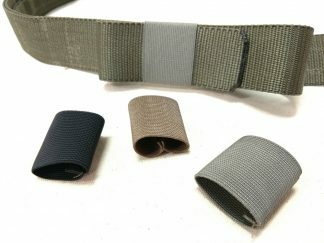 Two layers of firm weave 1.5″ Dive belt webbing. These belts are very stiff! 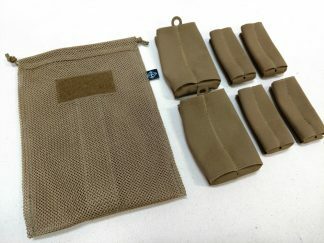 I purchased one of these to replace an aging leather belt, and have been using it everyday for about 2 months now to carry a Springfield XDS IWB style. The item arrived ahead of schedule, and included a nice compression loop for storage. Construction is solid, with sturdy stitching and no frills to worry about. The elastic retaining loop for tucking the working end of the belt is a nice touch and will be easily replaceable when the time comes, unlike the velcro straps sewn onto some belts. The belt has a good level of stiffness, not floppy and not too stiff. Cobra buckle is great and always feels solid. Comfort is greatly improved over the leather belt, as well as holster retention. Do note that it can take some time to figure out the right level of tension for this belt. I initially set it up to duplicate my leather belt, but experienced lots of discomfort from the bottom of the belt digging into my hip bones. Once I figured out the proper adjustment point, comfort drastically improved. Received the belts. (Spaghetti Western) All I can say is PERFECTION! You are a true craftsman. It sure is nice to have a custom made belt to your specific size. Instead of buying something off the rack that you have to make do with. I will be getting back to you soon with an order for the battle belt. Thanks for the stickers and the business cards. Love the Logo! This is a really great belt all around. I bought the gray 1.5 inch cobra with diamond stitching. My intent was to use this belt primarily as my EDC gun belt for concealed carry in civilian clothes. The belt’s looks and performance greatly exceeded my expectations. It’s just the right rigidity for comfortable EDC concealed carry and looks great with jeans or tactical pants. Simple review, awesome belt, have had it for about a year now. I’ve worn it every single day since I’ve gotten it. Great craftsmanship, simple low profile design that I love. Very comfortable with just the perfect amount of stiffness. Very good quality product, I expect it to hold up forever. Will definitely be doing more business here real soon. I just got mine in today very very high quality love it so far. Made by hands of a true craftsman! I’ve bought and tried a lot of different webbed belts this is by far the most comfortable I’ve worn. The belt not having Velcro gives it the feel of a leather belt. The keeper keeps the belt tucked tight and hasn’t slipped or fallen out.